The Beach Club Resort & Spa > Blog > What’s New in Gulf Shores? What’s New in Gulf Shores? Gulf Shores is always changing with the tides, usually the restaurants and building have been here for 20 plus years if they survived hurricanes and not much changes. This year is different, Gulf Shores is bursting at the seams with new and exciting activities and restaurants that are popping up like crazy. Here are a few of the newest and coolest that you should know about. The Village Lawn. 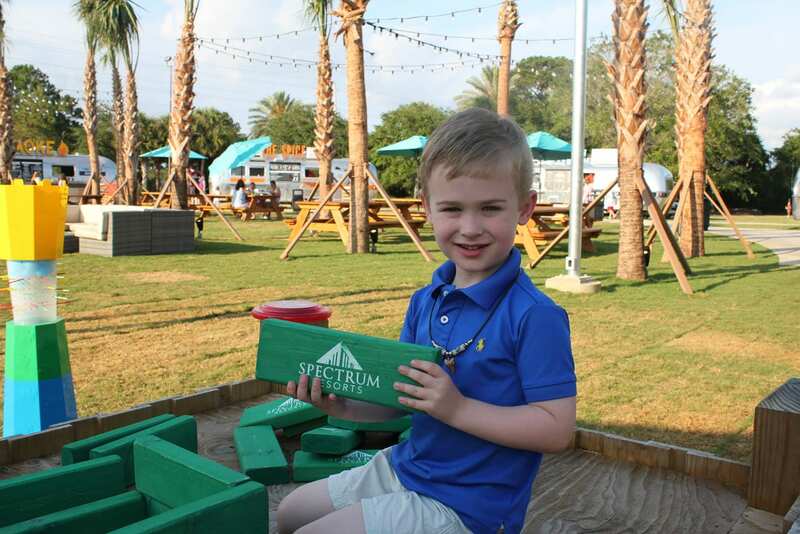 The Village Lawn at The Beach Club is a brand new entertainment venue with nightly live music crafts and activities and is open to the public. Located towards the end of Fort Morgan Road you will find a place to relax and have a good time with family and friends and good food served from vintage airstreams. Take a load off and grab a drink from The Chill. Go healthy with a hearty sandwich from The Press. Sit down and grab a napkin for a two- handed burrito at The Spice or feed the whole family with a family sized barbeque plate at The Smoke. Enjoy the summer nights and grab an ice cream cone to finish the night at the Village Creamery. This place has it all and is fun for the whole family. Burris Farmer’s Market at The Wharf. If you have ever been to Loxley, Ala, you know that the best farmer’s market is Burris, but it’s such a long drive for fresh food so you settle for the grocery store instead. Well, now you can shop the freshest foods while you shop and enjoy the night at The Wharf. Just like its primary location, Burris at The Wharf has fresh baked goods, all the in season produce and fruits you love as well as those quirky extras you’ve come to love in Loxley. Escape Room. Have you seen those escape rooms on TV where you have to work together to survive and you have one hour to do it? Well, it’s not just a TV thing for Hollywood or NYC anymore. You and your friends can try your hand at “escaping” obstacles designed to make you think and work together to “survive” in less than one hour. Choose from the Doll Room, Zombie Autopsy or Stop the Oil Spill to test your skills. Do you have what it takes to make it out in under an hour? The Factory. This is not your average backyard trampoline, if you had fun jumping as a kid then this place will blow your mind with fun. Jump until you can’t jump anymore! The Factory is full of over 50 trampolines with launching pads, foam pits, angled wall trampolines even air dodge ball and a basketball goal to dunk with style. Jump for an hour or all day, you can even have birthday parties and lock-ins with your own special music. Teens can have fun and meet new friends in a laser show every Saturday night between 10 and 11:30. All ages are welcome and parents can jump with little ones too. Pappadakis. You come close to visiting Greece with Greek food at Pappadakis. Located on Canal Road, enjoy a taste of the Grecian isle on the Gulf Coast. Enjoy a gyro or a Greek salad that will transport your senses with authentic food. A little secluded and off the beaten path, but worth the journey.